Check back soon for lecture registration. Join us for the Preserve’s Spring Celebration, featuring a Members-Only Lecture, featuring Dr. Dan Duran, and exclusive shopping opportunities for the spring opening of our Native Plant Nursery. The Nursery welcomes the general public at 1 pm. Getting to the Source of Our Native Plants: Does Provenance Matter? As native plants gain popularity in the horticultural trade there are important issues and challenges that need to be considered. The potential for genetic exchange between cultivated native plants and wild plant populations means that our landscaping decisions have impacts beyond the boundaries of our yards. Does the geographic source of a plant matter as long as it’s a native species? Are cultivars of native species equivalent to naturally occurring populations? These topics are discussed and recommendations given to help native plant enthusiasts make better-informed decisions for long-term survival of native species. 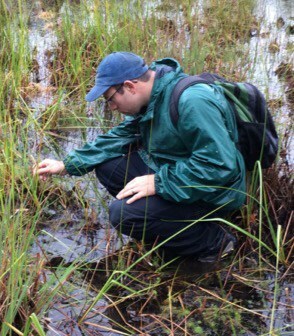 Dr. Dan Duran is an Associate Teaching Professor in the Department of Biodiversity, Earth & Environmental Sciences at Drexel University, where he has taught courses, including Biodiversity, Entomology, and Native Plants & Sustainability. His research is focused on the discovery of new species and advancing the fields of taxonomy and systematics, and examining the important roles of insects and plants in functioning ecosystems. He is a co-author of the book A Field Guide to the Tiger Beetles of the United States and Canada. Recently he co-founded The Mid-Atlantic Native & Threatened Insect Zoo. Additional Information: The lecture featuring speaker Dr. Dan Duran is an exclusive Members-only benefit. Learn more about becoming a Member of the Preserve.